3. Sustainable fashion: Sustainability and environmentally friendly concerns are playing into in greener and more conscious clothing options on the runways and on the street. 4. Fashion you can eat up: Food is becoming a fashion item. Moschino has done it with a McDonald’s themed collection and pepperoni pizza print outfits are all the rage. We aren’t so sure about this trend but who knows, you might be wearing your favourite meal soon? 5. Gingham: Michael Kors showed gingham dresses, while Diane von Furstenberg bought the print to a retro state. This cool and breeze pattern is going to be a spring hit. 6. The no-statement, statement bag: The statement bag of 2015 is simple, with limited hardware and a focus on restrain. Consider our Minimalist Jute Envelope Clutch to do the trick. 1. Feathers: Feathers can make a bold statement via a fabulous two-piece outfit or make a subtle entrance via an accessory such as shoes or a shawl. 2. Statement Stripes: You’re not going to be able to escape stripes’ clutches this spring (we can all thank Coco Chanel for starting the trend way back in the ’20s). Our Minimalist Jute Envelope Clutch fits with this trend too. 3. Safari Chic: Think green belted mini-dresses that invoked safari guides and fitted khaki trousers that would fit right in at an upscale event. 4. Sportswear: Lace-up details, stripes and tennis whites were used in subtle ways that brought a modern elegance to the clothes. 5. Subtle 70s: Flared trousers, jean skirts, retro collars and fringe sweaters were out in full force on the spring 2015 runways. 6. White: White is universally flattering and designers proved it by filling their runways with many shades of the hue on everything from sheer blouses to sweaters. 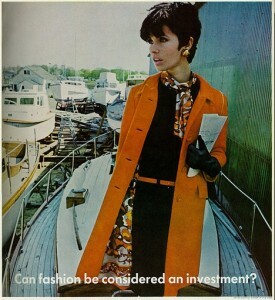 An ad printed in the pages of Vogue magazine in 1967 inviting consumers to think of fashion as an investment. Through innovative business practices, the fashion industry has come a long way in improving environmental and social conditions along complex global supply chains. Still, it has a way to go. A brief look into the industry’s storied past illuminates how corporate style setters have responded to shifting consumer demands, market trends and natural resource constraints over the years – signaling what the future of sustainable fashion might hold. In 1991 Nike came under fire for the low wages and poor working conditions at one of its Indonesian factories; consumer protests and boycotts, as well as heavy media attention, drove the company to make some serious changes to its supply chain. This and other tragic incidents (most recently the collapse of the Rana Plaza factory in Bangladesh) forced the industry to take stock and shape up. Patagonia’s Responsible Economy campaign is one example of a brand continually demonstrating to consumers how sustainability is sewn into its corporate DNA. Other companies have cleverly innovated to raise consumer awareness of their part in a garment’s life cycle, such as Levi’s Care Tag for Our Planet and Water<Less, Waste<Less, and Wellthread collections. It’s time to celebrate love and caring this Valentine’s day! We hope for this Valentine’s Day you purchased ethically made gifts, chocolate and other treats for your friends and loved ones. Light those candles, set the mood and share the message of ethical fashion! See you next year with more #GlobalLove for Valentine’s Day! “Many of us know on an intellectual level that most clothing retailers use sweatshop labour to create cheap, unsustainable “fast fashion.” But how many of us know it on a gut level what it means to work in one of these factories? It may either be a striking example of poetic justice or a staged publicity stunt, but an eye-opening, online docu-series called Sweatshop: Dead Cheap Fashion follows what happens to three fashion-loving Norwegian teens, in reality TV style, as they are sent by Norway’s Aftenpostennewspaper to work in a Cambodian sweatshop. As the teenagers are put to work though, the everyday reality of their now-fellow workers sinks in. Details like how a worker may sew the same seam for years, or how workers cannot afford the very clothes they make thanks to wages that barely even covers basic living expenses, are highlighted by cameras to demonstrate the inhumane insanity of an industry that squeezes their workers to lower prices for consumers, and to increase profit margins for the big companies. As part of an exhibition in Brooklyn, New York called “Cloud Couture”, Billie Whitehouse, an Australian designer explores how digital technology is being embedded in clothing. The show, at Pratt Institute’s Brooklyn Fashion and Design Accelerator in Williamsburg, runs until Feb. 12, with an open house on Sunday and tours by appointment at other times. Every garment on display is able to collect data signals from the wearer such as pulse, breathing, temperature, blood pressure and pheromones and transfer the information to the cloud. This exhibit shows the power and risks of wearable tech. On one hand, the ability to monitor and track in-depth data about our bodies might seem too invasive to some. Should the companies providing such tech be allowed to collect, store and analyze this data about consumer behaviour? However, the impact that this tech could have on fitness and health applications is promising. For example, wearable tech that monitors breathing, heart rate and other vital signs can be communicated by Bluetooth to a smartphone, a useful tool for people with chronic medical conditions. This wearable tech is not just innovative but also enables the use of LED and other technology to create new design esthetics, as well. The question is, how far can we go with this new technology?